For centuries nature has been our habitat. Many aspects of this natural habitat still have pronounced influence on our health and wellbeing. In this dissertation, two important aspects of nature have been studied; views to nature and exposure to daylight. The main focus has been on positive effects of these two phenomena as well as on the underlying psychological pathways of these beneficial effects. 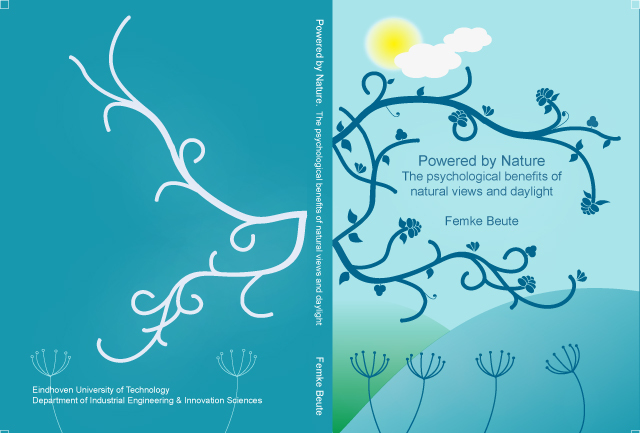 The first chapter of this dissertation presented a review of the evidence for beneficial health effects of nature and daylight. The main conclusion of this chapter was that natural views and daylight exposure rendered very similar beneficial effects on a variety of health outcomes, but both phenomena have been studied in two separate research fields. Not only did this separation oftentimes result in ignorance with respect to contributions of one phenomenon while studying the other, but there were also substantial differences in the experimental paradigms used, the outcome variables, and the proposed underlying mechanism. Therefore, it was as of yet unclear whether natural elements and daylight exhibit similar beneficial effects and whether they share psychological underlying pathways. For these reasons, the aim of this dissertation was twofold. First, we wanted to test whether daylight and natural environments share underlying psychological mechanisms. Second, beneficial effects of nature and daylight were studied separately, but within uniform research paradigms to establish whether their health-benefits overlap.